The rare and endangered dune habitat is encountered upon exiting the forest comprised of a mixture of Pinus halepensis and Pineus Pinea trees and travelling towards the coastal zone. 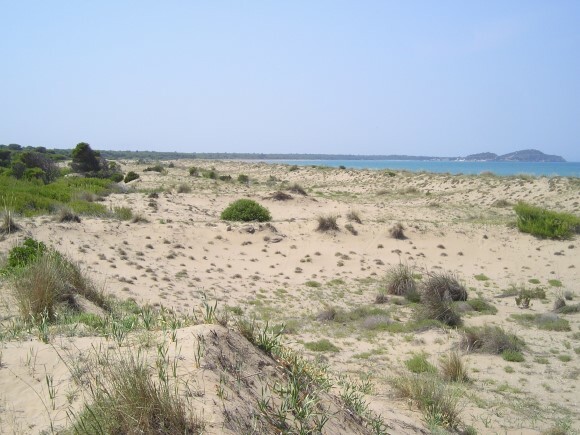 The dunes are formed by sea sand that moves with the aid of the westerly winds and the Ionian Sea waves. This process provides them with their characteristic undulating shape in a north to south direction. The dunes occupy an area of 200 hectares and can reach heights of up to 10 metres and widths from 20 – 500 metres. The dunes are a type of coastal habitat and play a significant role in the entire forest and wetlands ecosystem. They are a natural filter and flood barrier against salt water, which absorb the energy from the waves thus preventing the erosion of the coastal zone and providing protection to the wild fauna and flora. 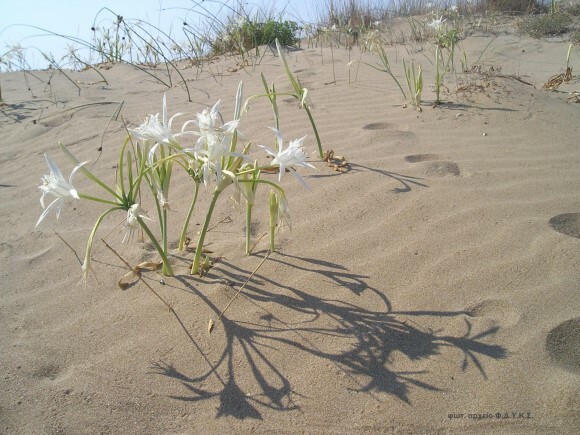 Plants that flourish on the sandy shores include the sea lily (Pancratium maritimum), Ammophila arenaria, Galactites tomentosa, which have adapted to cope with this hostile environment that is defined by strong winds with a high salt and sand content.